This list catalogs under-counter models in a variety of styles and form factors: Some are as narrow as 10-inch wide, to fit kitchens cabinets already cluttered by the dishwasher and the kitchen range, while others smartly separate white and red wines with french doors that give them a stylish boost. And, of course, some models make it a point to ostensibly display your most extravagant bottles using special inclined shelves. All the under-the-counter models shown here are shorter than 36 inches so they can be built-in under standard kitchen counters, but at least 31-inch high. to look like a right fit. They must also feature front ventilation and be described by their manufacturer as made for built-in use. 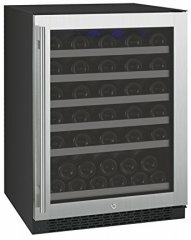 Even with a lower sample of reviews, considering its aggregated rank of 90%, we determined that the Frigidaire FGWC5233TS is currently Alphachooser's best under-counter wine cooler 2019. We also believe that our 37 reviews sampled from our sources give us a high confidence level (more on confidence levels) that justifies to call it a "no-brainer best choice." 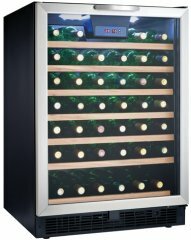 Unfavorable reviews concerning its delivery seem to the main con of the Kalamera KRC-18SZB Wine Fridge. 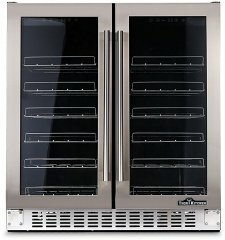 Apparently, several buyers have received their units with dents and damages, with some reporting to have received a completely-non-functional wine cooler. While instances like these are covered by warranty and replacement guarantees, we understand that it might be annoying. Still, a majority of this 4-star model's reviews are on the commendatory side. 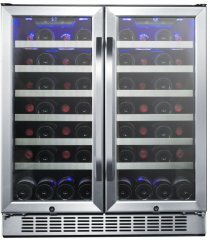 A lot of the 86 reviews that our system has scanned and analyzed paint a picture of the KRC-18SZB as a slimline under-counter wine cooler that's able to maintain stable temperatures while keeping a relatively-quiet profile. Design-wise, its appearance is generally-regarded to be tasteful, and its interior lighting and shelves have also received compliments. A user also pointed out that the controls were "very easy to use," but information from Kalamera doesn't seem to reveal anything about its control buttons which are out of the ordinary. Its design, however, is not perfect. 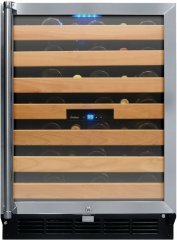 For a 12-inch slimline wine cooler -- which are made for smaller spaces under the counter -- it doesn't come with a flat power plug, which means that the unit has a tendency to stick out of the counter, given the clearance that has to be left at the back for the standard plug. This is remedied, of course, by using extension cords or flat adapters, but for a built-in wine refrigerator, it still feels like a design flaw. 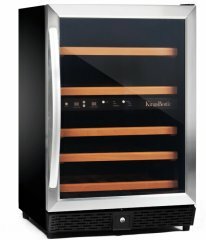 In the end, the KRC-18SZB still appears to impress most of its buyers, therefore landing the label Alphachooser's second best under-counter wine cooler 2019 in this subcategory. 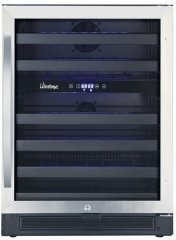 The Westinghouse WWT120MB built in wine cooler certainly sounds like a versatile model in terms of aesthetics, since a big portion of its 77 reviews say that it looks great with the design of their kitchens. It's not a completely-silent product, but it apparently emits only a low hum that does not disrupt daily activities (like the widely-needed and very necessary afternoon snooze, for instance). Take note that we've also seen feedback that say the contrary, reporting that the motor can get loud when it's trying to achieve a lower temperature -- but these reviews are significantly smaller in number compared to their more favorable counterparts (We're talking about only 15 percent of its Amazon reviews being three stars and below -- translating to a positive rating percentage of 85 percent, as of this writing). 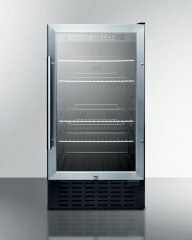 It works well cooling-wise and achieves the set temperature quickly, according to consumers. 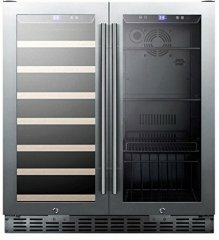 Aside from the pleasing physical experience, this wine fridge reportedly also feels well-built and made of high-quality materials. Like a lot of its peers, many of its negative reviews revolve around the issue of having tight shelves, which compromise the capacity advertised by their respective manufacturers. Users report experiencing scraped-off labels when taking out wine and champagne bottles, and we understand how this could be a major annoyance for wine enthusiasts. For most people, however, this 4-star model trumps out the competition in terms of over-all performance. 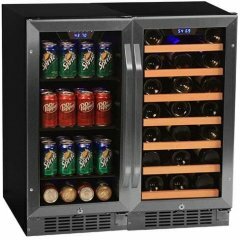 This is why our system has come into the conclusion that it is an Alphachooser good choice in this collection of the top 10 under-counter wine coolers. 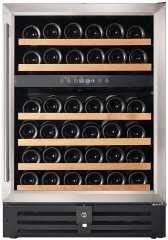 The 51-bottle Whirlpool WUW35X24DS is a built in wine cooler that is currently rated 4 stars from 109 reviews. 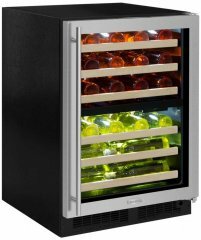 People generally say that it "cools at it should," and it appears like it's generally regarded as a reliable under-the-counter wine cooler in reviews. According to buyers, this model keeps temperatures very stable, and although it sometimes varies from the set coldness, it only does so by a few degrees. This reliability appears to be coupled with ease of use and installation -- again according to the customer feedback that we have encountered. Furthermore, it has also racked up approvals for its looks, with not a few people raving about its modern and sophisticated exteriors. The blue interior lighting (which is not exactly super rare, by any means) and sturdy-feeling handle were also mentioned quite a lot. However, some have mentioned that it made more noise than they were expecting, but noted that the sound level was still within the acceptable threshold. A very unfortunate few have reported hearing weird noises from this under-counter model after several weeks or months of operation, but fortunately encountering lemons such as these could be remedied by the warranty. 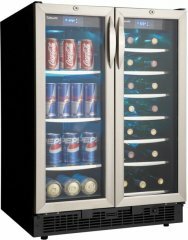 Unsurprisingly, there were also the all-too-familiar reports of the wine cooler not accommodating larger or wider bottles (like those used for champagne), but again, this is not uncommon among many modern wine fridges. 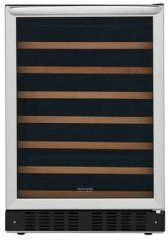 The Whirlpool WUW35X24DS impressed so many people that, in spite of having a few unfavorable reviews, it still ended up as an Alphachooser good choice in this list. 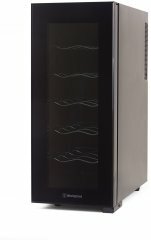 Although there are a few buyers reporting that their NewAir AWR-290DB built-in wine fridge started making very loud noises a couple of weeks after purchase, the majority of the 152 reviews scanned by our feedback compiler commend this model for running quietly. As such, it may be safe to assume that the extremely-noisy units are nothing but lemons, which should be remedied by the standard warranty policy, anyway. 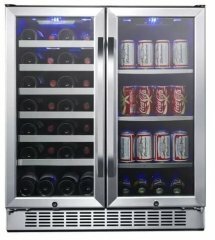 This under-counter wine fridge also earns a pat on the back from many reviewers for its ability to cool beverages quickly and keep the temperatures on its two zones fairly stable. 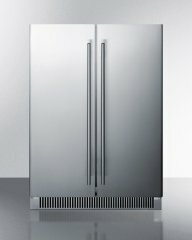 Consumers also generally describe their units as attractive-looking and well-made enough to act as a freestanding unit. To top it up, the NewAir AWR-290DB's door hinge can be transferred onto either the left or right side, which should be a good thing for people with constraints in this department. 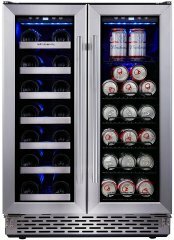 However, reviewers have also pointed out that the NewAir logo would be upside down when the door is attached for a right-hand opening -- unless you settle for saying you just bought a "Riawen" wine cooler and impress the snobs? 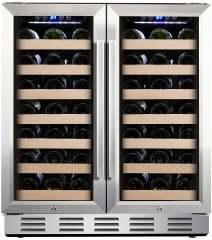 Many of the less-than-satisfied customers claim that this built in wine cooler does not actually hold 29 bottles of wine -- a common complaint about under-counter wine refrigerators which tend to have very optimistic bottle counts, so just be aware that your mileage will vary. Moreover, the not-too-unfamiliar protests about too-tight shelves also made an appearance among this 4-star model's reviews. 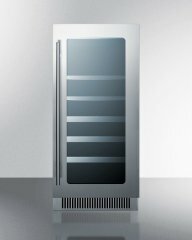 This 15-inch wine fridge nonetheless has more fans than critics, ending up as an Alphachooser interesting choice under-the-counter wine cooler in our database. 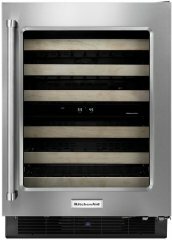 The Allavino FlexCount VSWR56-1SSLN Wine Fridge garnered a combined rating of 4 stars across 56 reviews. 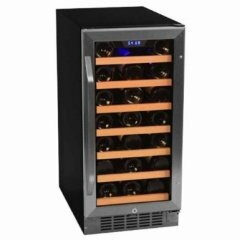 Such respectable rating puts this under-counter model as an Alphachooser interesting choice on our database of built in wine coolers. 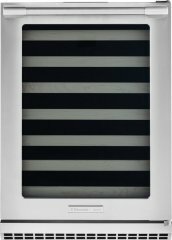 Glowing reviews on Amazon describe the product as "extremely quiet", with a lot of buyers also praising its design -- not only its sophisticated looks (that enables this 24-inch model to act as a freestanding unit, as well), but also how "smooth-gliding" its shelves are and the "solid feel" of its door. The option to avail either a left hinge or a right hinge version also gives this under-the-counter unit added flexibility, on top of the two handle types (towel bar type and a curved handle) that are already included with every unit. 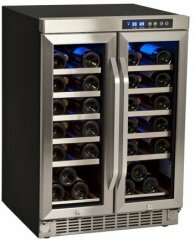 Since it features a digital display and a thermostat, we assume this model poses as a suitable option for the extra-particular wine connoisseur. Most reviewers report that the temperature consistency is good, while an unfortunate few claim that the thermostat reading on their respective coolers is actually off by a few degrees. Some even more unfortunate folks report receiving dented units, but this should be covered by the warranty, anyway. A more consistent "flaw" would be the closeness of some of the shelves. Several reviewers pointed out that sliding out a shelf resulted to scraped-off labels on some bottles, thus ruining the bottle presentation -- a real bummer, we imagine, unless you care more about what is inside than the outside. 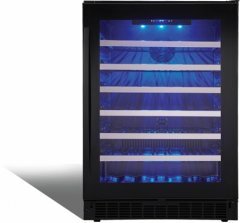 That being said, our review crawler relies accurately on review averages from multiple sources and, want it or not, profiled the Allavino FlexCount VSWR56-1SSLN as a runner-up in our comprehensive database of built-in wine coolers. 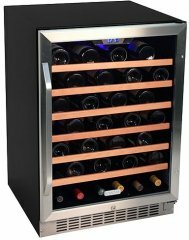 The (rating temporarily unavailable)-star-rated EdgeStar CWR70SZ slimline wine cooler lies outside of the best under-counter wine coolers list. Like any other model, it has received its share of complaints and compliments -- all of which may explain its ranking (or lack thereof). 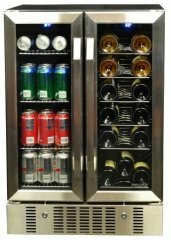 Many of the authors of the reviews that our system has analyzed praised this 7-bottle built-in model for -- you guessed it -- fitting nicely into narrow under-counter spaces without any problem. 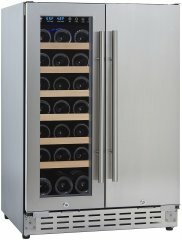 Its buyers greatly appreciate it for its design and "good quality materials", as well -- no surprise there, as the combo of a metal exterior and blue interior lighting appears to be a tried-and-tested formula for most wine coolers that are fighting for a space in modern kitchens. Additionally, it gets props for being quiet. 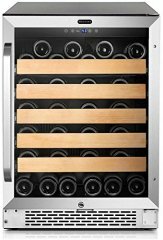 On the other hand, this under-the-counter slimline wine cooler apparently cannot accommodate longer-than-average wine bottles. 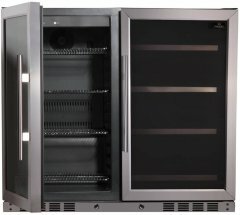 Now, complaints about how thicker wine and champagne bottles have difficulty fitting in is a familiar issue with many wine coolers, but the CWR70SZ's criticisms revolve around lack of depth, instead of width. If this was an extra measure that EdgeStar has undertaken to be more compact, or if it's simply a design flaw, no one can tell. But as a 6-inch model, it certainly earns brownie points if your kitchen space is extra limited. Even with this criticism, the EdgeStar CWR70SZ's reviews are mostly-positive. However, the fact remains that it probably would've fared better in our list without the said limitation. 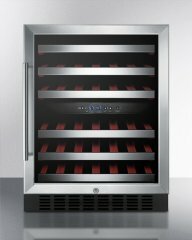 In general, the Allavino FlexCount VSWR56-2SSLN has been praised for being able to do a "fine job" in cooling wine and champagne. However, not a few users have pointed out that it does tend to fluctuate a few degrees from the set temperature every now and then. This by no means impairs it from doing its job, but it may be a possible deal-breaker for wine connoisseurs who are extra-particular about their drinks' temperature who may then want to look at several other items of this list, which were specifically praised for their consistency. Additionally, there's the issue of temperature restrictions encompassing its two zones. Apparently, Allavino has set that this model's bottom zone has to be warmer by a certain temperature difference (reviewers usually report four or five degrees) than the top zone, which has disappointed buyers looking for more flexibility. 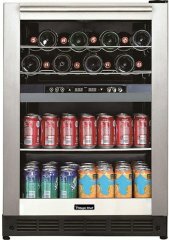 Despite this above-mentioned limitation, most of its consumers seem to be nonetheless pleased with this under-counter wine cooler, achieving a (rating temporarily unavailable) stars rating across the reviews that were surveyed and averaged out by our system. Many reviews laud it for being quiet, and the fact that two door handle types are included with each unit seem to be largelyappreciated. Even though it's marketed as a built-in model, buyers have noted that its "clean-looking" and "absolutely beautiful" design enables it to act as a freestanding unit, as well. But then again, there's the issue of closely-spaced shelves that's not uncommon in many under-the-counter wine coolers. This 24-inch model is not immune to complaints about scratched-out labels brought about by tight spaces on its middle shelves. 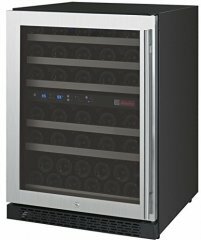 The Allavino VSWR56-2SSLN has its own strengths and weaknesses, and the bad points seem to have affected its chances, preventing it from bagging a spot on our best under-counter wine coolers list. 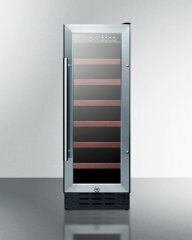 The Allavino VSWR56-1SSRN Wine Fridge is advertised as a 56-bottle built in wine cooler. 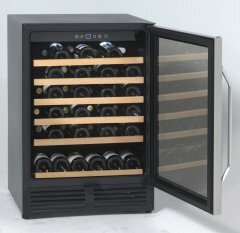 However, according to a sizable chunk of the reviews that our comprehensive feedback aggregator has scanned, being able to store 56 bottles of wine in the unit is nearly unachievable -- unless all the wine bottles you have are in the standard size and you follow a rather constricting storage pattern. Despite this, it has earned an over-all rating of (rating temporarily unavailable) stars, which may be explained by the good points briefly discussed below. 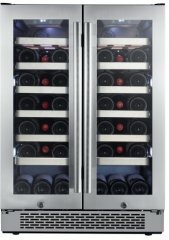 Numerous reports indicate that this under-the-counter wine fridge excellently maintains steady temperature. Although the temperature gauge has been widely-reported to be off by a few degrees, the coldness inside the unit purportedly does not demonstrate fluctuations. Furthermore, the VSWR56-1SSRN has earned massive approval for its looks, where the option to install either a towel bar handle or a curved handle supplements the already-stylish exterior. 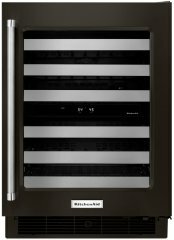 With its metal and glass finishing, it's not hard to imagine how this 24-inch unit can fit harmoniously with many kitchen designs, even as a freestanding wine cooler. A number of reviews also lauded this built-in model for being quiet, but there are also buyers that complained about its noise. As such, the issue about its sound levels remains subjective, since wine coolers unfortunately don't come with noise ratings. While its shelves seem to be generally-regarded as sturdy and nice-looking, complaints about them not sliding far enough cropped up every once in a while. This has made reading labels on the back-facing bottles challenging for some buyers. 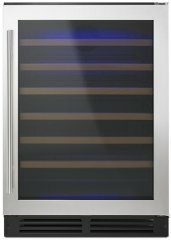 These appear to be valid complaints, which makes it unsurprising that this Allavino under-counter wine cooler has failed to make it to our list of the best models in this subcategory. 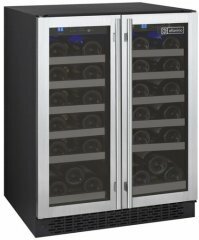 This two-door, dual-zone wine and beverage fridge earned a (rating temporarily unavailable)-star rating across customer reviews, according to the analysis of our automatic scanning system. 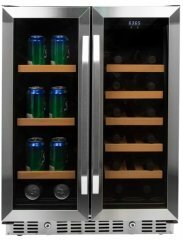 As a 24-inch built-in model, it claims to fit 18 wine bottles on one side and 60 beverage cans on the other. 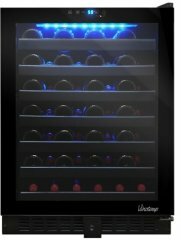 Many reviewers found this feature handy, especially the folks who prefer having their wines at a temperature different from their beers. The majority of the customer feedback that we have read claim that the NewAir AWB-360DB does a great job at cooling their beverages and keeping the temperature stable. Its shelves are also reportedly smooth-sliding and well-designed. The common compliments go on, with much emphasis given on its stylish design and on the security locks on both doors. 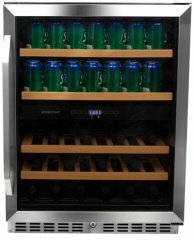 On the other hand, a considerable number of buyers have expressed their grievance about this under-counter wine cooler's noise level. Many of these buyers have claimed that their units were a lot noisier than they had expected, even though the wine fridge operates under the counter. 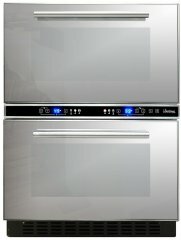 One user also made a remark saying that the AWB-360DB produces too much condensation, which lessens its attractiveness. 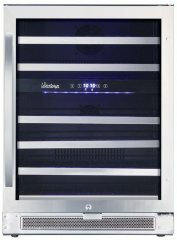 This Allavino contender lost its chance of being in the Top 10 best under-counter wine coolers, probably due to the aforementioned flaws. But in the end, it's just a matter of deciding whether its cons make it such a huge no-no, or if they can be excused for the sake of being able to enjoy its good points. 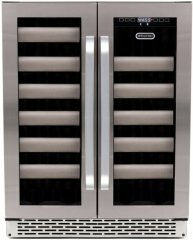 Obviously a narrow-styled under-the-counter cooler is part of only a few wine refrigerators that are at or under 15-inch wide, obviously for smaller kitchens... or wine collections. It also features wire racks, but with a wooden front. 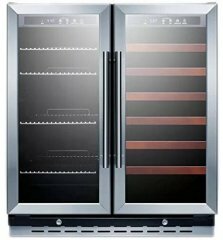 French-door models are rare, but this one lets you store up to 20 bottles per zone, giving it one of the lowest capacities among built-in under-counter wine fridges that are roughly 24-inch wide. We assume that to be the trade off that comes with the convenience of having two zones, each with its own door. The WC04 sports three removable shelves in case you want to customize its storage capacity. The EdgeStar CWR181SZ, with its rating of (rating temporarily unavailable) stars from the reviews that our system has automatically scanned, appears to have swept most buyers off their feet. Used largely in small under-counter spaces to replace trash compactors, its 12-inch body has earned praises for being easy to carry and install. Additionally, customers have noted that it works well and operates fairly quietly in spite of having a compression refrigeration system. 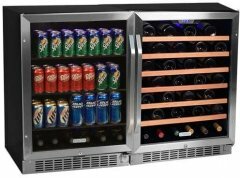 Although some buyers have reported that it deviates slightly from the set temperature, they are quick to note that it's nothing that greatly hinders this under-counter wine cooler from doing its job. Many people have also complimented it for being well-designed -- its sleek physical appearance has obviously gained it a lot of fans. On the other hand, some buyers have knocked a star off its rating because apparently, it's "a little snug" for its advertised capacity of 18 bottles. Fitting in the said number of wines is possible, but the shelves are pretty close to each other, which means that having bottles which may be longer or wider than the standard can reduce the capacity. However, the reviewers who took offense because of this said issue are greatly outnumbered by those who are satisified with the EdgeStar CWR181SZ. 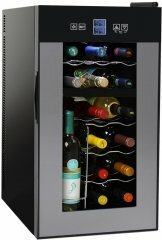 This under-counter wine cooler seems to have performed well enough to earn such a promising reputation, but perhaps it needs the approval of a lot more people (at least compared to its rivals) in order for it to earn a spot in this list of the top 10 models. 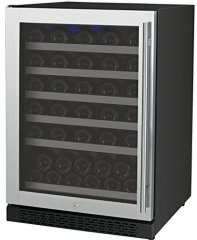 A 50-bottle wine cooler with two temperature zones, a lock with two keys and a fan-circulated compressor cooling system. 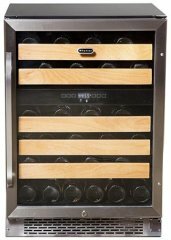 A 36-bottle dual-zone wine cabinet that can be used as a built-in or a freestanding unit. 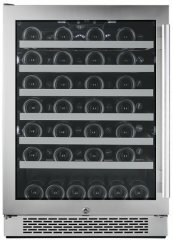 The 27-bottle Danby Silhouette DWC276BLS boasts a narrow 12-inch-wide form and a childproof lock. Aside from these more straightforward key features, a number out of the feedbacks that our extensive reviews appraisal system has scanned pointed out that this specific model fares well in maintaining stable temperatures throughout its operation. Appreciation for the soft blue interior light and digital display isn't uncommon, as well -- although you should know that these aren't especially rare features. 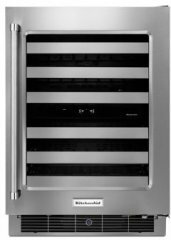 The stainless steel exterior was also commended quite a lot of times, as this under-the-counter wine cooler's muted-yet-sophisticated design makes it a potential good fit into a lot of modern kitchen designs. With these, it's not surprising that this (rating temporarily unavailable)-star-rated model has attracted its own share of buyers. On the other hand, most of the complaints we've encountered on its reviews revolve around the subject of its operating noise, which seemed to have been louder than what many of its buyers would have liked or expected -- most especially for a unit its size. This may have compromised its appeal greatly enough that it does not currently make it to our top 10 list, judging from where it ended up in our evaluation of under-the-counter wine coolers.